How do artists work? Students are in the process of producing their own optical illusion drawings using Sharpies. By breaking down shapes and lines and arranging them in a way to design and to reconstruct those shapes and lines, gives new context to the journey. Fourth graders have begun the printmaking process. The four-week long project involves drawing a Seashell Theme from observation. Students felt the smoothness and roughness (texture) of various shells and then drew shells in an interesting composition. Observation establishes authenticity. After drawing a shell design, students learned how to carve into a foam printing plate. 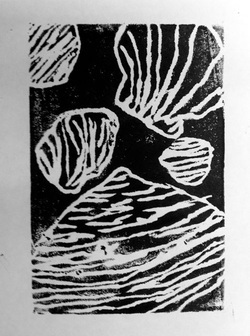 Once the plates were carved, students worked with partners to "pull a proof" on manila paper. Students will be printing a series of cards on various colored paper using different ink colors. The final part of the printmaking process is to sign, write a title, and to number each card. The numbering of prints involves math, incorporating counting and fractions. If there are eight prints in a series, then the cards would be numbered like so: 1/1, 1/2, 1/3, . . .
What is Repoussé? Repoussé is shaped or decorated with patterns in relief formed by hammering and pressing on the reverse side of metal such as aluminum, copper, or brass. Students used 36 gauge aluminum to carve relief. They added a patina by painting black India Ink onto the surface and then rubbing away the ink to leave only some behind. The result is an antiqued look. Fourth grade students worked in small groups to create Connecticut Maps using cardboard and salt dough. In Social Studies, students researched the four land regions, studying terrain and rivers. Students practiced presentation skills by recording what they learned using the Educations app on the iPad. Educations allows students to take a picture of their work, record their voices, and draw on the picture to show an area of interest. Students collaborated earlier this year with with Second and Third Grades by taking photographs of the school gardens. This photo of edamame was selected as the top favorite on a blind contest. Each winning photograph enlarged, framed, and displayed in the respective elementary school. Students recently completed designed and illustrated their passions as Word Art. Thinking about how type (typography) impacts the viewer is vital in good design. Fourth Grade students will carry their knowledge and skill in creating Fire Prevention Posters as part of the Connecticut Fire Prevention Poster Contest. Brainstorming Session: What is an idea that you could use in your poster? Dialogue about typography and images that could create IMPACT. Sketch out a plan on 9” x 12” white drawing paper. Create a final poster on 12" x 18" white drawing paper. All ideas must be original: no trademark items or photographs. Major theme: Fire Prevention, Everyone/Everyday must be present on your poster. All posters are due at the end of November and will travel to the County Fire Marshall where posters will be judged. Winning posters from each county will be judged at the CT State Level. The winning poster will be printed on the 2014 CT Fire Prevention Poster.